Patients were to be educated and trained to perform tasks and labour that would make the institution self-sufficient so as “not to be a drain on the public purse”, as Dr MacMurchy, Inspector for the Feeble-Minded in Ontario 1905-1920, urged. New admissions were divided into two main groups: the “High Grades”, with above 50 IQ, who were ambulatory and could work and contribute to the economy of the institution. They were the most important group and highly desirable. The group with below 50 IQ were labelled “Low Grades”, and though many of them might be able to perform low-grade work such as shovelling coal, many were unable to work at all, and needed the support of others, such as the “High Grade” patients and regular staff. A constant complaint of superintendents over the decades was that there were never enough “High Grade” patients to do the work and ease staffing. The High Grade patients did the work of hired staff, thus relieving the cost of wages since their labour was unpaid. Though on the surface it appeared that they were receiving “vocational” and “occupational” training which might enable them to work outside in the community, a close look at their labour shows many patients working long hours, a regular working man’s day outside in the community. Farm Labour: This was an important aspect of the economy of Orillia. On the surface it would appear that the farm boys had a healthy enjoyable life working in the fields planting crops and harvesting, and working in the barns with the dairy herd, and in the hoggery. In 1936 and into the 1940s, there were 96 head of cattle, with a daily milk production of 2,500 pounds, 131 swine and 13 sows, and 1000 chicks with 90% survival. 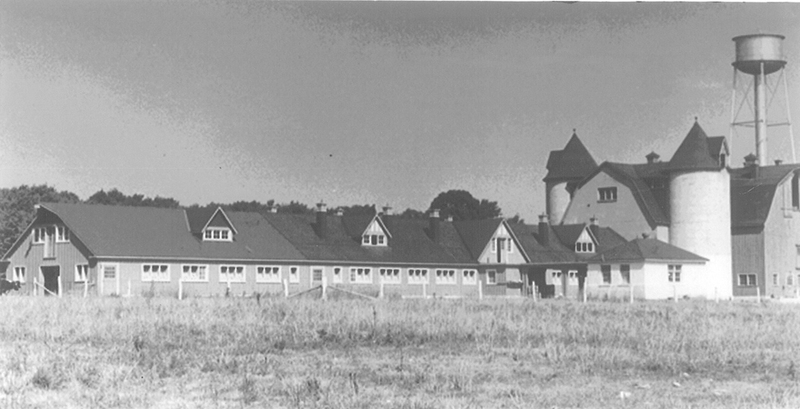 Orillia institution farm, today the site of the OPP. Photo courtesy Archives of Ontario. The “farm boys” lived segregated from the main population in the institution, in Cottage “F”. Boys were shaken out of bed at two-thirty in the morning for milking at three am. with breakfast served not until eight am. Out in the fields, boys worked long hours working alongside hired labourers. In 1935 they harvested 550 bushels of oats, at 35cents a bushel, that brought in $192.50. They also harvested 3,000 bushels of mangels at 10cents a bushel, bringing in $300 for the farm. Dunn Farm, Cottage “F” (also called Farm Colony House): Farm colony house, ½ mile from the hospital. Quiet older parole type patient, resides 23 males there, have main meals in Cottage “C”. Supervised day and night by attendant. House in poor condition – Floors bad – some of the windows are out, verandah falling down. In the attic you can see daylight through the walls. Toilet poor in a shed, therefore impractical to use in winter. Lease expires June 30th, 1937. Farm labour continued well into the 1960s. Survivor Desi Harnum recalls that in helping out with the pigs boys were treated “like pigs”. Shoemaking at Huronia. Photo courtesy Archives of Ontario. Shoemaking Shop: Boys and men also provided good income for the institution in shoe-making. Under Mr Downey’s superintendency in the 1920s and 1930s, boys turned out up to 30 pairs of shoes a day, as well as all grades of work boots and walking shoes for the girls. This industry in 1932 brought in $14,802 for 305 dozen pairs of shoes and in 1941 sales were valued at $10,425. Tailor Shop: Another productive source of income for the institution using patients’ free labour. 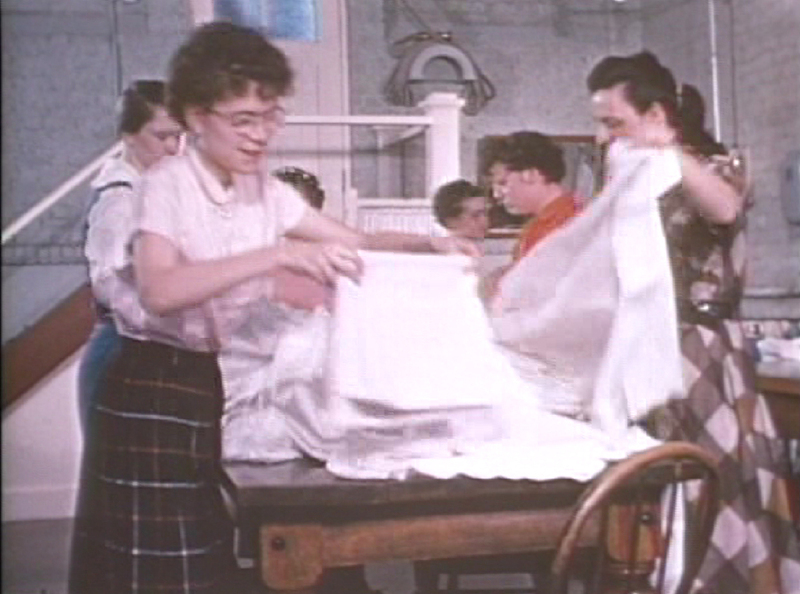 Boys not only made clothes for patients such as shirts, smocks, caps and staff uniforms, but they filled orders from other institutions. Tweeds made by patients in Guelph Reformatory were used to make clothing at Orillia. Furniture Repair Shop: ‘High Grade’ boys helped repair furniture, while ‘Low Grades’ did sanding and varnishing. Night Monitors: 'High Grade' older boys and men were often used to as night monitors in the wards, locked in with the patients. These men had to work by day at various jobs and do the supervision of staff when staff were not available, at night. Inspectors disapproved of this practice, but the institution was short-staffed. ‘Low-Grade’ Boys’ Labour: Boys and men deemed “low grade” in intelligence, or “Imbeciles”, were nevertheless put to work, doing physical labour around the institution, such as shoveling coal in the “coal piles”, berry-picking, removing sludge from drains, draining marshes, snow shoveling. Ward Work: “Low Grade” girls were assigned “Ward Work”, which included washing and scrubbing institution floors in wards, hall-ways and the nurses’ residence, cleaning out slop pails in the old women’s residence, cleaning up urine, blood and feces of other patients, gathering up soiled laundry. They also served in the dining rooms, helped out in the kitchens preparing food, cooking, cleaning, setting up trays. Sometimes girls got burned on the hot steam pipes in the kitchens. Dining Room and Kitchen: They also served in the dining rooms, helped out in the kitchens preparing food, cooking, cleaning, setting up trays. Sometimes girls got burned on the hot steam pipes in the kitchens. Laundry: Patients did 28,000 pieces of laundry per week. Boys and men helped out at the laundry as well as girls, because the wet sheets in the machines were too heavy to be lifted out by girls. Patients did 1,200 sheets and articles of clothing per week. Girls were also used to help look after old women in Cottage “L”, for instance, helping change their diapers and clothes, bathe them or hose them down, feed them from side trays. Sewing Class: From the 1930s onwards up into the 1970s and 80s, sewing was an important part of self-sufficiency in the institution economy. Girls and women sewed most of the clothes worn by patients, such as underwear, dresses, pleated skirts, middies, blouses, smocks, pantie suits, ties, nightgowns, bath-robes, nurses’ uniforms, as well as sheets, pillow-cases, towels, aprons, curtains, mattress covers; also socks knitted on the auto-knitter. They even made their own straight-jackets! Domestics on Probation: Many girls and women in the institution were of normal intelligence. Along with the “high grades”, those with an IQ above 50, they were trained as domestics and allowed out on probation under strict supervision, living in Colony House, a home in the town of Orillia. They were employed as domestics in citizens’ homes in town, working from eight in the morning to six at night. They kept half their wages, banked for them in accounts, and the other half went to the institution. Dr Horne, Superintendent, in the 1930s, reported that the per capita cost of maintaining each girl out on probation at Colony House had been 75 cents per day compared with 86 cents per day for residents in the hospital, giving the institution a small profit. Employing girls as domestics in the town continued into the 1970s and 80s. Kitchen work. Photo courtesy Archives of Ontario. Girls in laundry. Photo courtesy Archives of Ontario. Baby suffering from hydro-cephalus. Photo: Wikipedia. Girls and women sewing. Photo courtesy Archives of Ontario. Sewing. Photo courtesy Archives of Ontario. 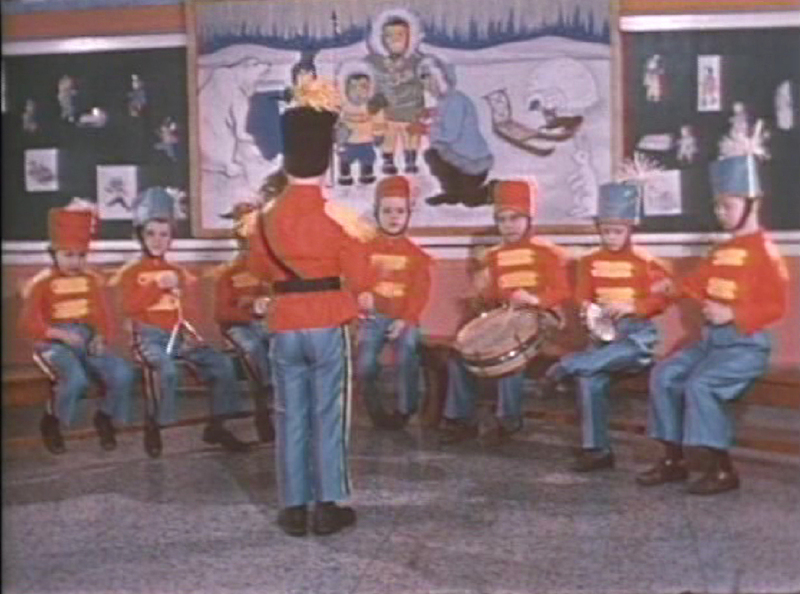 Children’s Band, Ontario Hospital School, 1960. Orillia Choir, Ontario Hospital School, 1960. Swings at beach, Lake Simcoe, part of the grounds where children swam and played. Slideshow photos courtesy of Archives of Ontario.